The state of Virginia is known for producing a variety of foods, from ham to crabs to apples. But perhaps most of all, Virginia is known for peanuts, and along with the abundance of peanuts in Virginia comes peanut soup. I grew up in Pennsylvania, so I had never even heard of peanut soup before moving to Virginia. Since then I’ve tried peanut soups in restaurants all over the state, from the famous Jefferson Hotel in Richmond to our local diner here in the Shenandoah Valley. Every one of the soups has been delicious, but one in particular really knocked my socks off last Fall. It was a rich, savory peanut soup with so many layers of flavor I couldn’t identify them all. My husband and I agreed. It was, no exaggeration, the best soup we’d ever tasted in our lives. I call it the Best Soup Ever. Since then, the soup has been taken off the restaurant’s menu. I’ve emailed and emailed to beg for the recipe or even just a hint on how to make it at home. No response. So I finally decided to take a stab at it on my own. I remember that magical soup was a peanut base with butternut squash and chili oil. To make my version I used a classic peanut soup recipe, then added the flavors I was sure were in the original. My soup has a strong peanut flavor with a kick of red pepper to add some heat. It’s both salty and a little sweet, and very rich and creamy. The butternut squash flavor doesn’t come through as much as I thought it would, but the squash’s sweetness helps balance the saltiness of the peanut butter. Does it taste exactly like that Best Soup Ever? Sadly, no. However, it is pretty fantastic in it’s own way. Just how fantastic is this soup? After I took the photos for this post, my husband asked for a taste… and then promptly devoured the whole bowl. Preheat oven to 375°F. Line a baking sheet with foil and spray with non-stick cooking spray. Spread the butternut squash pieces in a single layer on the baking sheet. Divide 1 tablespoon of butter into small dabs with your fingers and scatter over squash pieces. Sprinkle with salt. Bake 25-35 minutes, or until squash is easily pierced with a fork. Meanwhile, saute onion and celery in 2 tablespoons of butter until softened, about 5 minutes. Stir in flour to form a paste and cook 2 minutes. Pour chicken stock in slowly, whisking to break up clumps. Add red pepper flakes. Bring to a boil and simmer, stirring occasionally, for 15 minutes or until slightly thickened. Strain the stock mixture through a fine mesh sieve into a 4-cup measuring cup or large bowl, pushing on the solids to extract the most flavor. Reserve the extracted solids. In a food processor or blender, puree roasted butternut squash with about half of the reserved solids until smooth. Add the soup back to the pot over low heat. Stir in peanut butter, half & half, and butternut squash puree. Whisk until peanut butter is melted and soup is smooth. Whisk in lime juice and brown sugar. Cook over low heat, whisking often and without bringing to a boil, for 5 minutes or until soup is hot and reaches desired thickness. Garnished with chopped dry roasted peanuts and serve. I’ve never had peanut soup but I am officially intrigued. I love butternut squash soup, so hey, why not? I wonder if you might get your more intensified squash flavor with a whole roasted squash? I usually split one in half and roast it face down on an oiled cookie tray. You know… I’ve lived my entire life in Virginia I don’t think I’ve ever had peanut soup. I’ve had Thai peanut sauce… but not soup. Looks intriguing! I can’t believe I’ve gone my whole life without eating peanut soup! Me, a person who can’t go two DAYS without eating peanut butter! Yikes. I’d better get on that. This soup looks absolutely delicious! Love that it has squash in it. My two favorite things in one bowl. Sigh. Bon Appetit has this monthly feature where you can write in to them and ask (beg) them to procure a restaurant recipe for you. They might help! I’ve never had peanut soup before, although I have heard of it and always been intrigued. I love the addition of butternut squash–my favorite vegetable. Your pictures are fantastic as always! I love Virginia and its peanuts. 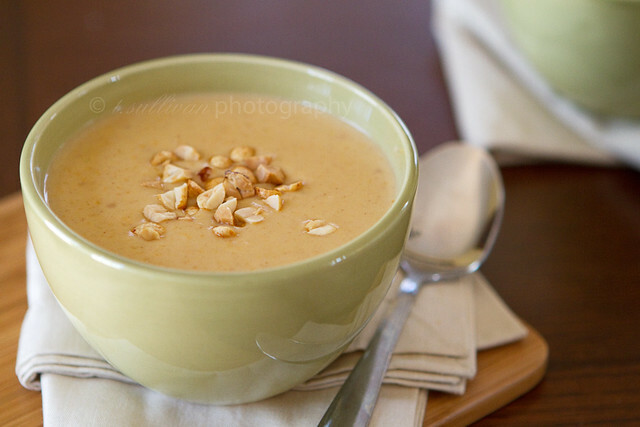 I live in Yorktown and have had a many a bowl of peanut soup, BUT have never made it. YUM!! What a beautiful combination of ingredients (and beautiful photos). Butternut squash & peanuts are a couple of my favorite foods, so I just know that I would love this. It’s going in my saved recipes file for sure. Thanks! Peanut butter and butternut squash are two of my favorites foods, but I have never combined them together. Why not? This soup looks fantastic, and the lime juice sounds like the perfect refreshing final touch. This sounds lovely! I’d never heard of peanut soup before, but boy am I intrigued now! This soup incorporates so many of my favorite things. I must try this with the butternut I just bought. I misread the title as ‘Peanut butter soup’ which I dismissed as impossibly insane, only to read further on and see there really is peanut butter in the ingredients! My husband is a huge fan of both butternut squash and peanuts, so I can see myself making this for him very soon! What a unique soup! I can’t eat heavy cream or butter because of my stupid cholesterol, but I may have to try a vegan version with olive oil and almond milk! Interesting combo, one I hadn’t seen. Loved the popcorn recipe too. This recipe is familiar to an African Peanut Soup I love so I gave it a try today. I followed it exactly as written and next time will use only 1/2 c peanut butter as it was too strong for me. Otherwise great feel good recipe I will use again and again. Thank you! Let me know how you like it with less peanut butter! 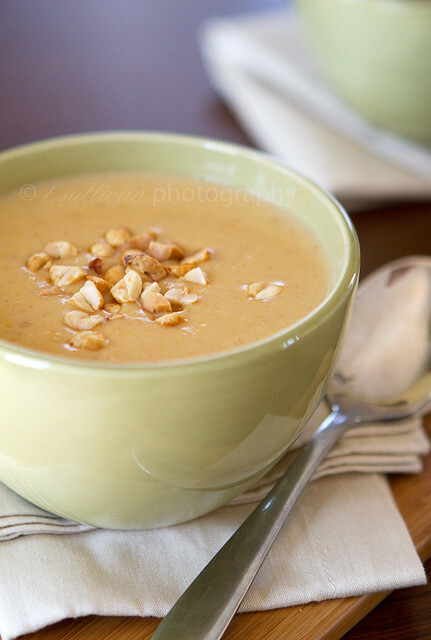 Virginia peanut soup is very peanut-y so in that respect the recipe is accurate. But I bet using less peanut butter would make the butternut squash flavor stand out more, which would be equally delicious!